Hey, I am Mr vice for our Squadron's dining out. what the should I put in the grog? For members of Georgia Wing reading this and getting any ideas, a reminder that the Commander has disallowed grog bowls at all GA Wing events. If y'all have questions, please address them through channels. The grog was literally my worst experience in CAP as a cadet. There is no reason to subject a cadet to this ever. Broken dreams and empty promises. Conversely, the grog resembles some of my most fun and memorable times a cadet. But did it serve a legitimate purpose? No, and it certainly falls within the realm of hazing. There just isn't a place for it within CAP's modern standards of practice. "Two fingers from the bowl of social grace"
Grogs are prohibited in my AOR. Pure hazing, plain and simple. Grog's can be an excellent, fun, and camaraderie building part of a social event or they can make it so that no one wants to visit the next social event. When done right, a grog is enjoyed by everyone and absolutely not in any way even remotely close to hazing; the key is doing it right. All of this was placed in a CLEAN stainless steel bowl which was itself placed inside of a CLEAN (as in unused) toilet. 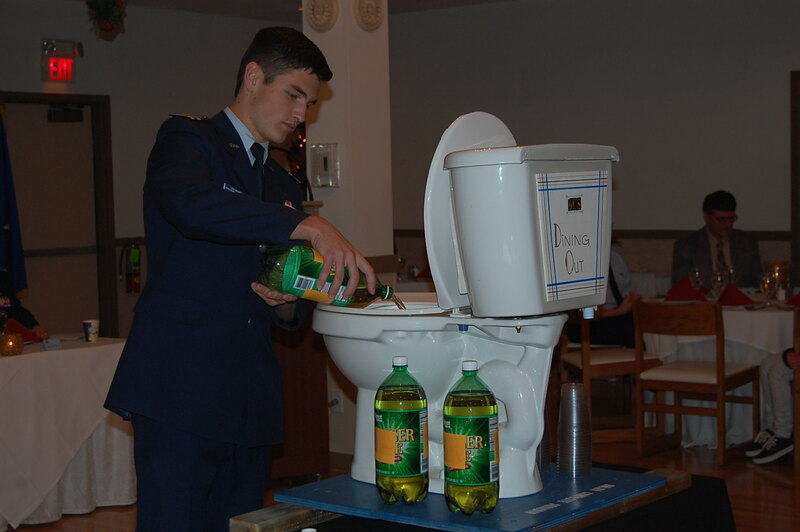 Some of the cadets were a little apprehensive at first, but by the end of the night everyone wanted to get sent to the grog bowl because it tasted so good. In fact, as the President of the Mess, I waved my own immunity to the grog and was the last person to visit it that night. It is my hope that no senior would permit any sort of noxious grog as a CPP issue, but I suppose a "simulated noxious grog" (where Mr. Vice and minions appear to make a horrible drink, but through various sleights of hand the offending ingredients are not actually added to the punch) is not a violation per se. I have added eliminating grog to the "next time we revise the 60-1" file for consideration. The last time i encountered it (2 years ago at an encampment of not my own wing) it was a bunch of fruit juice, jello, soda, and salt. As the only SM sent to the grog i can attest it wasn't bad. Done this way I think its fine. But yes it can come close to hazing if not properly managed, and sour future members. Do with that what you will in these hyper-sensitive times. It took me a little longer than it took Eclipse, about three searches but little less than a minute. And there are others. Disgusting. Such a visceral reaction to ginger ale. Sheesh. I mean, I know it's not everyone's favorite, but it's not as disgusting as say, Tab Cola. Its not the drink, its the container! And if it was Ginger Ale, we wouldn't be having this discussion. Well then you would have really not approved of what my Air Force unit used at our "Combat" Dining In's (Combat = Flight Suits/ABU's). A toilet and a urinal. CE says they are both brand new right out of the box. The medics said they were clean.